Growing up in Vancouver, Canada gave my family easy access to vacations on the Oregon coast. Year after year, my parents and I drove down through Washington state and on to Oregon’s pounding surf and endless sand. As much as I loved running from the crashing waves and collecting seashells, it was really all about the seafood. Even as a kid, food was always near the top of the agenda. Not much has changed. Our favorite place to stay was the Inn at Spanish Head near Lincoln City, partly for their prime cliffside location and easy access to the beach, and partly because each unit included a full kitchen where we could steam Dungeness crabs and sear scallops that we picked up from the docks first thing in the morning. Yep, all about the food! Thankfully I married a man who likes his shrimp and crab as much as I do. We have unabashedly brainwashed our two boys to think that there’s nothing better than savoring a succulent shrimp or sucking the meat out from a crab claw. They are willing participants in the whole brainwashing process. Fresh strawberries are starting to appear at our markets and add a wonderful pop of sweetness to offset the lemon parsley dressing. As for the jicama and avocado – well, they’re the perfect foil for each other, one crunchy and one creamy. 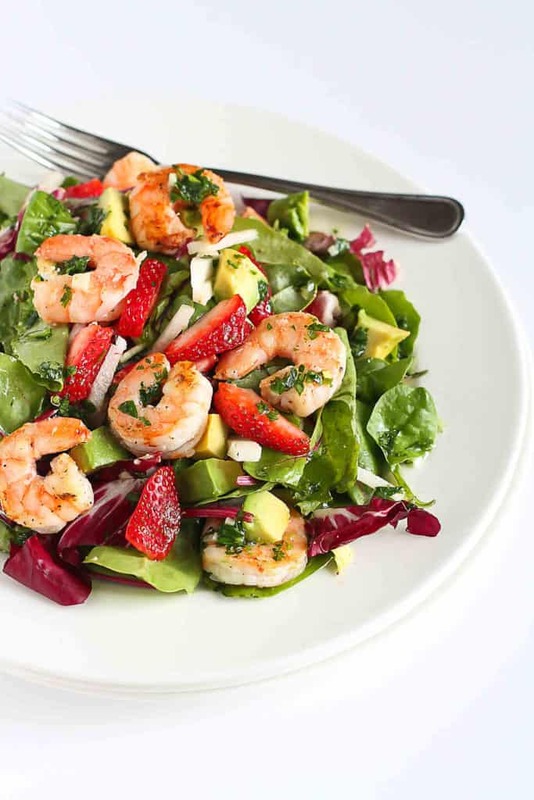 We ate every last morsel of this dinner salad and it left my kids begging for more shrimp. Mission accomplished. Before seasoning or cooking the shrimp, pat dry with a paper towel. Dry shrimp will sear and brown; damp shrimp will steam. You can either toss the shrimp in oil (such as olive oil or canola oil) before adding them to the skillet, or you can heat the oil in the pan, then add the shrimp. Regardless of when you’re using the oil, be sure to season the shrimp with salt, pepper and any other herbs/spices before adding to the skillet. I typically toss the shrimp in a bowl with the seasonings. Searing means to cook the shrimp quickly at a high heat. Set the burner to medium-high heat and make sure the skillet is heated before adding the oil and/or shrimp. Shrimp cooks QUICKLY, particularly at high heats, so don’t walk away from the stove. It should only take about 1 minute per side, which will produced slightly browned, succulent shrimp. Overcooking tends to turn shrimp into little rubbery morsels. 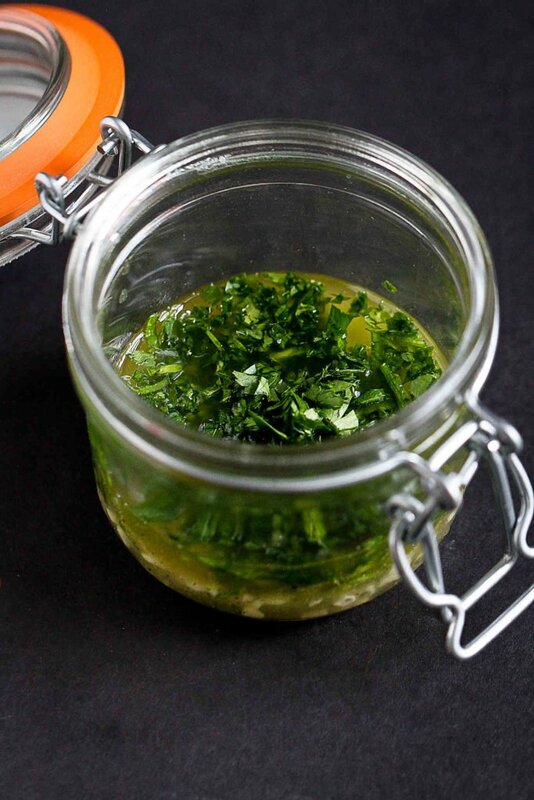 This recipe was originally posted on April 9, 2015 and was updated on April 11, 2019. This salad is perfect! I love the ingredients – so fresh and bright – and delicious! Want this really soon!!! What a delicious and healthy salad! I love the addition of the jicama! I hope to brainwash my future kids someday in the same way! haha! Love this and love shrimp soo much! Thank you Dara for the nice salad. 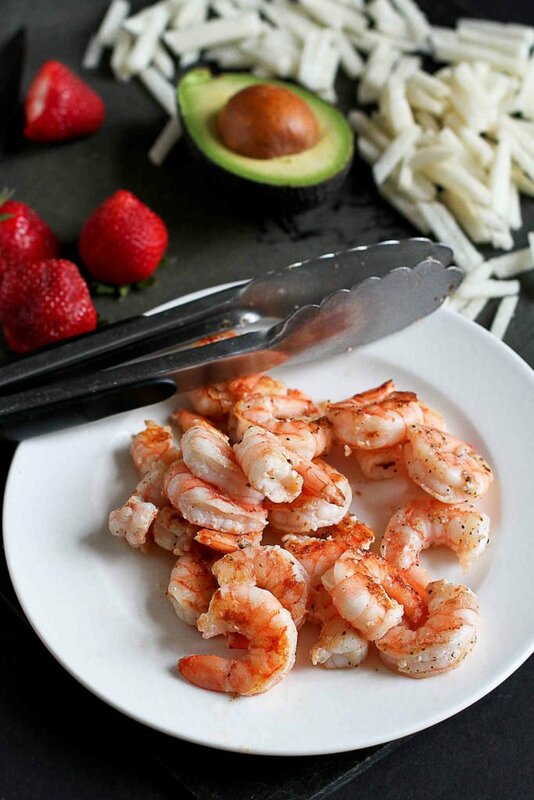 Mmmmm…I love the sound of shrimp and strawberries together. Lovely spring salad! This looks SO GOOD. I definitely want to try it ASAP! oh Dara, I really love this salad!! This is such a beautiful salad. And jicama! Love it and I kind of forgot about it until just now (I hate when that happens!). Thanks for the reminder. And love love love the Oregon coast. Glad you have so many fun memories there! 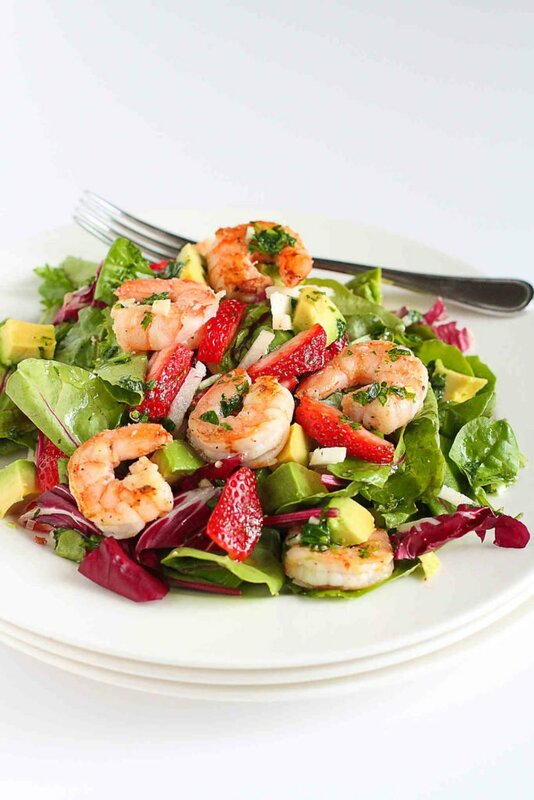 I loooooved shrimp as a kid too – it definitely felt fancy and “grown up.” This salad looks super tasty – I love the combination of shrimp, strawberries, and avocado. So full of delicious good for you ingredients! We’ve always had seafood allergies here so we can’t partake but when I see this it makes me wish I could gobble it all up. It looks so inviting and fresh. The strawberries just pop off the page. This recipe is amazing! Must be delicious.